Exactly two years ago, my haiku collection, Haiku Rhapsodies, (Verses from Ghana) debuted in grand style to popular acclaim. To the glory of God, It sold beyond my dreams and won the enviable Atukwei Okine Award for Best Poetry Book under the auspices of the Ghana Literary Awards in 2017. 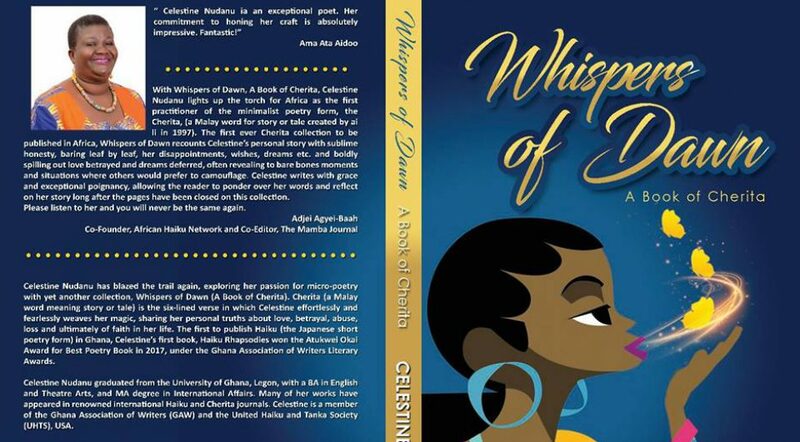 Two years on precisely, my second poetry collection, Whisper of Dawn ( A book of Cherita) the first of its kind in Africa, has hit the stands, arousing much wonderful interest home and abroad. 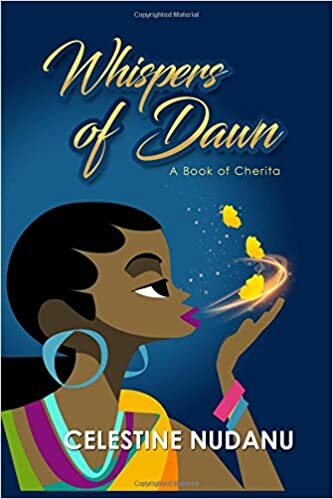 Whispers of Dawn, my book of Cherita, of six lines that tell the story of love, disappointments, the joys of death and the joys of a life in Christ. This is a refreshing read for any poetry lover! The author’s choice of words are at once spot on, and engaging- leaving the reader wanting more. This ought to be a must-read for literature students. Celestine is a prolific writer of poetry, plenty of which is showcased on her blog, Reading Pleasure. After gaining a fan base in the past few years, a book was a welcome treat for her readers. C’s work has featured in many international Haiku publications and as such is already well recognised within the Haiku community. With clear imagery, each bite sized piece is simply written but layered with visual beauty and thoughts personal to the author, this intimate showcasing allows the reader to see a place through Celestine’s eyes. The concepts of the world around her is brought to us in a series delightful vignettes which read like a moment captured in time. Perusing these, I find myself transported to an Africa I found tangible, Celestine’s eye for observing the things around her and combining them into something so evocative is a pure joy to read. There is a feeling of peace and clarity through the book that encouraged me to take each poem and then spend time to build up one’s image and the accompanying thoughts around it. The beauty of such poems is that I allowed myself to get lost in this new place, imagination took over and each piece felt like part of a jigsaw building up a picture of an Africa that was in part real and in part my own romantic take upon it. Naturally Ghana and a distinctly African feel came up a lot in my thoughts as I read through but there is also a good amount of content which is distinct from the African connection and appeals at a universal level. This is a good book to dip into, exploring various themes – Afriku, Nature, Haiku My Heart, The Divine, and Death – and I found myself taking my time to soak up the atmosphere and then build up an image of this personal take on what surrounds us. For me this book is like one of those coffee table books, that one picks up and chooses a page at random but in this case, each morsel is best digested singularly, with concentration and with much reflection. 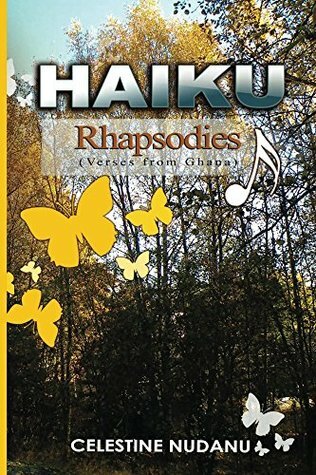 HAIKU RHAPSODIES – ANOTHER EXCITING REVIEW! Celestine Nudanu has been a blogging friend for several years. We met through our shared love of Haiku, the Japanese short form poetry. She hails from Ghana, a country I fell in love with in 2007, unfortunately before Celestine and I ‘met’. Haiku Rhapsodies, Celestine’s first publication, is a real feast for Haiku, the book is divided into five sections, Afriku, Nature, Haiku My Heart, The Divine and Death. Afriku is my favourite. Our poet’s words are so very evocative, bringing back memories of my brief visits to West Africa flood back. Here are just a few examples to tempt you. and has a firm belief that poetry has a place in our final moments. Haiku Rhapsodies deserves a place on the book shelves of those who enjoy the form, not just in Africa, but wherever we find ourselves in this vast world of poetry. Folks, another beautiful review of Haiku Rhapsodies from Debbi Antebi, UK. Thanks a million, Debbi. Spanning five main themes, Celestine’s poems make us see, hear, smell, taste and touch, as well as feel. Her haiku depict stories that are universal, and they do so through vivid imagery. One of my personal favorites is about a mother gathering her unsold melons at sundown. This haiku evokes feelings of sorrow and hopelessness in twelve short syllables, capturing big emotions in a concise way. I have many other favorite poems in the book, and I am confident that the readers will enjoy exploring them just as much as I did. Strongly recommended for all poetry lovers! Haiku Rhapsodies – Another 5 Star Review! A superb collection of simple yet intense verses that can be read in one breath, and some more. The author weaves with words, and brings about vivid and thought-provoking images. Brevity of a poem focusing on a particular moment communicates a raw thought, yet is beautiful and offers deep insight. In all, this is a joyous and an enlightening read. I highly recommend it. 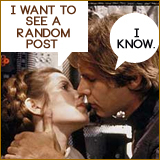 Lisa Hill, whose fine book blog, ANZ Litlovers Litblog I follow and comment on, has reviewed my book Haiku Rhapsodies on both her blog and Goodreads.